Pregnancy is a major life event in any women’s life. It transforms her physically, mentally, spiritually & socially. The nine months of pregnancy are accompanied by a roller coaster ride of hormones & emotions for a woman. In addition, due to the accompanying changes in her body, she brings about many lifestyle changes at a personal &amp; familial level. Yogasanas & Pranayamas prove to be beneficial for pregnant women as they help her cope with the mental & Physical transformation that pregnancy ensues. They also help a woman in preparation to endure the pain associated with childbirth. Some of the Yoga practices that can prove beneficial for pregnant women are as follows. 1. Sukhasana: Also known as the easy-sitting pose, Sukhasana entails sitting on the ground with legs stretched out followed by gradually folding & tucking the left leg inside the right thigh & the right leg inside the left thigh. Keeping the spine erect & hands in your lap, deep relaxing breaths can be taken to calm the mind. It is a comfortable pose and useful while performing pranayamas & meditation. 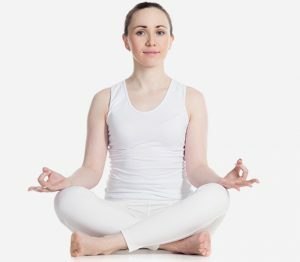 It is also useful for meditators who due to stiffness in hips cannot sit in Padmasana. 2. Butterfly Pose (Ardha Titali Aasan &Poorna Titali Aasan): The butterfly is a very comfortable and useful pose for pregnancy. It prepares the woman for delivery. The Ardha titali Aasan or the half butterfly pose can be done by stretching out your feet in any sitting posture, slowly bending one of the feet & gently resting it on the other thigh. This is followed by gently raising the knee towards the chest and lowering it towards the floor to the lowest possible distance. The Poorna titali Aasana or the full butterfly pose can be done by outstretching feet in a sitting position. Keeping the spine straight, bend the knees gently in a way that feet are togehter. Then, bring the soles of the feet together and join them. Comfortably, attempt to bring the soles close to the groin. Holding your feet with both hands, make sure that the knees are pointing at the opposite direction. Then, press the knees slowly towards the floor. you can comfortably continue your practice. Ensure that you are pressing your knees softly. Do not make any sudden and harsh movements. Touching the floor is not essential, ensure your safety & comfort at all times. Then, slowly press your knees up and repeat again. 3. Neck exercises: Neck exercises can help relieve the additional stress on the neck due to the increased body weight during pregnancy. To perform a neck stretch, sit up straight in a supportive chair. Close your eyes and take a deep breath, then gently tilt your head to one side and let it slowly drop toward your shoulder. Raise the shoulders to meet the head is not required. Holding for three to six seconds, switch sides. Repeat three or four times. Gently bring your head forward, letting the chin relax on the chest. Roll the cheek to the right toward the shoulder, without any force and hold for three to six seconds. Switch sides and repeat. 4. Ujjayi Breathing: Also called “the psychic breathing”, this Pranayamas practice is useful in increasing the length of your breathing . To breathe using Ujjayi, breathe in and out deeply through the nose.When you breathe in, contract your glottis muscles and there will be a hissing sound. As you breathe out, release the contracted glottis muscles. 5. Bhramari Pranayama: Practice of the Bhramari Pranayama during pregnancy strengthens the endocrine system and aids in childbirth. To perform Bhramari Pranayama during pregnancy, sit in the Sukhasana, close the eyes and breathe deeply. Next, close the ears lid or flaps with the thumbs. Place the index fingers on your eyes, middle fingers at the sides of your nostrils, ring fingers just above the upper lip and the little fingers just below the lower lip. The inhalation and exhalation will be through the nose , concentrate the mind in the third eye area between your eyebrows. When you exhale, keep the mouth closed and breathe out through the nose while making a humming sound of honeybee. While performing this Pranayama, experience being connected to all the positive energies of the universe. 6. Cat Pose: This pose helps relieve back pain during pregnancy. To perform it sit on your hips and place hands directly under the shoulders. While inhaling look up between the eyebrows, while gently raising the head. While exhaling, round the back bringing the chin towards the chest. Press the hands on the floor and push the centre of the back towards the ceiling enhancing the roundness of the back. 7. Mountain Pose: The mountain pose helps to maintain the posture &amp; in concentration during pregnancy. Stand with your feet hips distance apart on the ground (this can be assumed by placing the two fists between the feet). Place the feet so that the outer edges are parallel. Feel your feet support your body. Stand with the pelvis slightly tucked so that there is a slight engagement in your belly, and avoid sticking your bottoms out (thereby putting strain on your lower back). Imagine the two shoulder blades reaching towards one another on the back, creating strength in your upper back as well as opening up the chest. Align the head by holding the chin parallel to the floor and slightly back to create one straight line moving from your back all the way up through your neck. Let the arms come down by the sides, palms facing inward, or reach your arms up to the sky (if it’s comfortable) for extra strength and power. 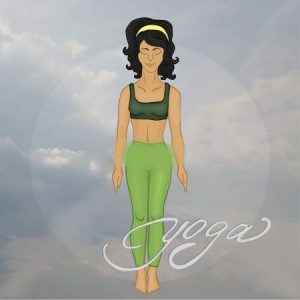 In addition, yogasanas & pranayamas like Trikonasana, Veerbhadrasana, Shavasana, YogNidra and Anuloma- Viloma can also be practiced during meditation. Yoga is a great way to balance the stress in the body & mind and help a woman cope with all the changes that pregnancy entails. The practice of Yoga also strengthens &prepares a woman for child birth. In the end, I would like to advice, that always do yoga in the presence of a certified yoga instructor or first learn properly under the guidance of a competent teacher &amp; then you can do it yourself as well.